For directions to the Amador Theater, click here. For the Firehouse Arts Center, see below. Directions from San Francisco, Hayward, Walnut Creek: Head south on I-680 to Bernal Ave exit, stay right at Bernal Ave off-ramp, turn left at First St, turn left at Spring St, entrance to parking will be on your left. Directions from San Jose: Head north on I-680 to Sunol Blvd exit, stay right at Sunol Blvd off-ramp, continue onto First St, turn left at Spring St, entrance to parking will be on your left. Directions from Livermore, Tracy: Head west on I-580 to the Santa Rita Rd exit, turn left at Santa Rita Rd, continue onto Main St, turn left at Spring St, entrance to parking will be on your right. 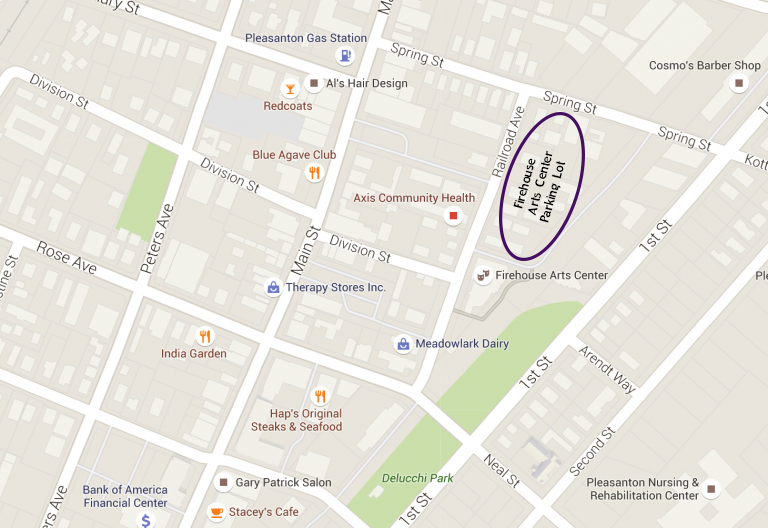 Parking: There is free parking in the lot adjacent to the Firehouse Arts Center (indicated below on the map). Limited street parking is also available.